1. Thread Size: M8, high-quality metal and plastic base. If the mounting hole size is M8, you can use these leveling feet to install your product feet. 2. The length of the screw can be adjusted according to the needs during the use. It can be rotated 360 degrees. You can adjust it by multiple angles rotation to make your product more stable and balanced. The good flexible adjustment provides a perfect experience. 3. They are particularly suitable for the product that is swaying during the use due to rough floors or bad leg of the product. 4. 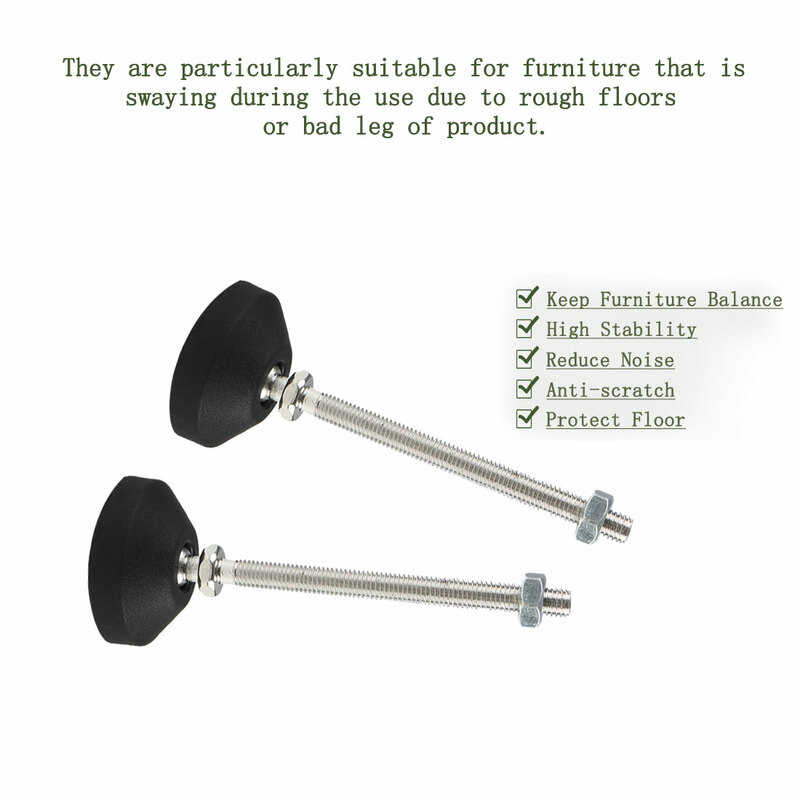 It does not harm the floor and without noise during the use due to the plastic base. The goal is to make the customer feel satisfied with our every product. We are confident that you will be pleased with the purchase of this product. 5. The adjustable leveling foot is for the industrial machine with threaded sockets. It was applied to the fitness equipment, mechanical equipment, goods shelf, stands and so on. 6. Install it to adjust the height of the device, the device is firmly connected with the ground to provide a better support, maintain the level, avoid displacement and shaking of the device during the use. 7. Install it to increase the height of your product while improving the overall stability, decreasing the overall area of the product in contact with the ground, reduce frictional resistance, then move more effortless. 8. We provide the metal nut and it can steady for your factory equipment or goods shelf. 1. Before buying this, use the tools to accurately measure the diameter and specification of the mounting holes of your product, determine the size that you need, then buy the right one. 2. Put a suitable leveling foot into the mounting hole, screw it to the height that you want.